A "large scale, spectacular attack in Europe or the US": this is the prediction of the Netherlands' Intelligence Service (AIVD). And, they say, it could happen very soon. The AIVD's report on 2015, released last week, analyzes the threat of terrorism, cyber-terrorism, and other national security issues based on the past year's events and global intelligence-gathering. The agency found that ongoing competition between jihadist groups is proving even more dangerous than the threat of continued "lone wolf" attacks and localized bombings by jihadists who have either returned from the Islamic State or were inspired by them. That competition, particularly between al-Qaida and ISIS, is likely to lead to major attacks on the West in order to "demonstrate to one another that each is the real leader of jihadism," the AIVD report says. This is particularly crucial for al-Qaida, which may stage an attack soon in order to re-assert its prestige and power at a time when ISIS seems to be getting the most attention. These predictions align with similar warnings from former CIA operative Brian Fairchild, who last fall also warned of "another 9/11," driven by rivalry among the terrorist groups. That rivalry is intensifying as various factions continue to battle for power in the Levant. 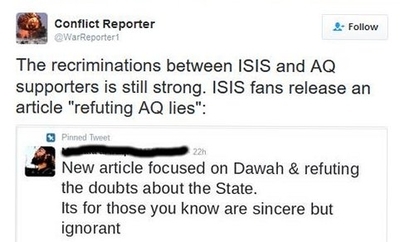 Al-Qaida, for instance, recently published a statement accusing ISIS of "lies and deceit," and describing them as "one of the biggest dangers today in the jihadi fields." And in a video, al-Qaida leader Ayman al Zawahiri called ISIS leader Abu Bakr al Baghdadi, "illegitimate." ISIS, according to al-Qaida, "invoked the curse of Allah" on its opponents, specifically on Jabhat al Nusra. Al Nusra, which has pledged allegiance to al-Qaida, is considered another powerful rival of ISIS. Like the AIVD's 2005 report, "From Dawa To Jihad," now something of a classic in the literature about the radicalization of Western Muslims, many insights presented in this year's overview are likely to be taken seriously by intelligence agencies and counter-terrorism strategists globally. Alongside concerns about a major attack in the near-term, for instance, the AIVD report offers an analysis of the complexities of Islamic terrorism at this moment – and the vastness of its reach. "The attacks in Europe present a disturbing illustration of the threat Europe currently faces: people from our own homelands, who grew up here and mostly were radicalized here, stand ready and willing to take up weapons against the West [....] So, too are jihadists who return from the battlefields of jihad prepared to perpetrate similar atrocities [at home] – and jihadists who had planned to join the foreign battle, but never succeeded [in making the trip]. Young, inexperienced jihadists can perpetrate attacks, but those jihad-veterans known to intelligence officials and who have long been quiet may also suddenly come roaring back." Similarly, "attacks could be planned and attackers sent from outside Europe, or they can be planned and activated from within; they could be major attacks, arranged by professionals far in advance, or relatively simple and small-scale," the AIVD report says. "The threat can come from organized groups and networks sent in to commit attacks but also by individuals or small groups who sympathize with a certain jihadist group." Moreover, the terrorist group Jabhat al-Nusra (JaN), which often is misleadingly characterized as "moderate," poses an additional threat. "JaN is a jihadist organization connected with al-Qaida and whose purpose, in part, is to commit attacks against the West," the report says. And while the death of many al-Qaida leaders may have caused some disruption, this does not mean that the organization is weakened, or that the threat of another al-Qaida attack against the West has vanished. Rather, battling for the mantle of dominant jihadi group could strengthen its determination to wage spectacular attacks. And it isn't just violent attacks. While the AIVD has found a rising interest among Dutch Muslims in obtaining weapons, the agency notes that in at least one case, the purpose was to perform a series of armed robberies in order to finance terrorist groups in Syria. What is certain is that Salafism, the radical Islamic ideology that supports violent jihad, is very much on the rise in the Netherlands. Added to this development is the ISIS propaganda machine, which the report's authors say, sends the message that terrorism is a form of heroism. Combined, the two forces stand to raise radicalization and the probable involvement in terrorism in the homeland. For the Dutch, as for other Europeans, the danger does not just come from jihadists at home and those in Syria. Belgium, with its many extremist and terrorist groups, is just across the Dutch border. Paris is a short, high-speed train ride away. And as officials increasingly crack down in those two countries, the chances are great that terrorists there will travel elsewhere, looking for the nearest place to hide – and kill. The result is a multi-pronged threat that hovers over the country, and increasingly, over Europe. We are just getting over 911. We need a congress, president that has our interests at heart not what they want but what will make America strong and brave.